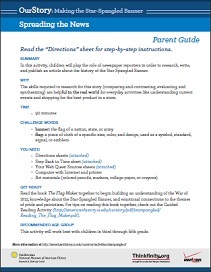 In this activity, children will actively read The Flag Maker, using these suggested reading questions. 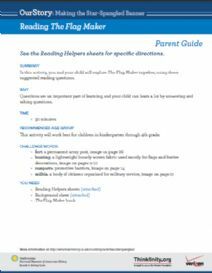 They will be better able to read for understanding and answer questions using written and image resources. 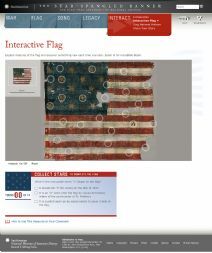 It is included in an OurStory module entitled Making the Star-Spangled Banner. OurStory is a series of modules designed by the Smithsonian's National Museum of American History to help children and adults enjoy exploring history together through the use of objects from the Museum's vast collections, quality children's literature, and engaging hands-on activities. Ideal for afterschool use, OurStory resources allow children to think critically, to be creative, and to achieve academic standards both in and out of the classroom. CCSS.ELA-Literacy.RH.11-12.3 (Key Ideas and Details): Evaluate various explanations for actions or events and determine which explanation best accords with textual evidence, acknowledging where the text leaves matters uncertain. CCSS.ELA-Literacy.RH.11-12.4 (Craft and Structure): Determine the meaning of words and phrases as they are used in a text, including analyzing how an author uses and refines the meaning of a key term over the course of a text (e.g., how Madison defines faction in Federalist No. 10). CCSS.ELA-Literacy.RH.11-12.5 (Craft and Structure): Analyze in detail how a complex primary source is structured, including how key sentences, paragraphs, and larger portions of the text contribute to the whole. CCSS.ELA-Literacy.RH.11-12.8 (Integration of Knowledge and Ideas): Evaluate an author's premises, claims, and evidence by corroborating or challenging them with other information. CCSS.ELA-Literacy.RH.11-12.9 (Integration of Knowledge and Ideas): Integrate information from diverse sources, both primary and secondary, into a coherent understanding of an idea or event, noting discrepancies among sources. 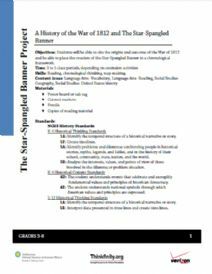 CCSS.ELA-Literacy.RH.11-12.10 (Range of Reading and Level of Text Complexity): By the end of grade 12, read and comprehend history/social studies texts in the grades 11-CCR text complexity band independently and proficiently.